Coleslaw isn't the only kind of cabbage salad out there - roasting or grilling wedges of cabbage before drizzling them with a vinaigrette spiked with smoky, spicy Vanns Chipotle Chili Powder reveals an entirely new side to this versatile vegetable! 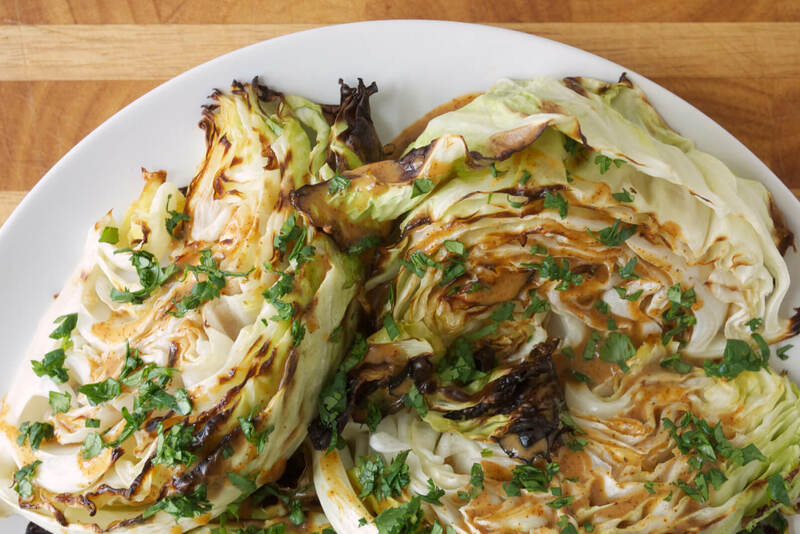 When cooked using high heat, cabbage becomes nutty and sweet, the perfect base for a vinaigrette made with honey, sharp lime, earthy Vanns Oregano, garlic, and smoky, spicy Vanns Chipotle Chili Powder. With no shredding involved, this salad may actually be easier to put together than coleslaw! If you don't have access to a grill, your broiler will work equally well. Vanns Kosher Salt, to taste, around ½ tsp. To make the dressing, combine all ingredients except for chipotle chili powder in a mini food processor, bowl of an immersion blender, or bowl of a regular blender. Blend until smooth. Add chipotle chili in ½ tsp. increments, blending and tasting between each addition, until your ideal spice level is reached. Add kosher salt to taste. To cook the cabbage in the oven, heat the broiler to high. Brush the cabbage wedges with around 2 Tbs. oil and arrange in a single layer on a pan. Broil, turning every 5 minutes or so, until nicely charred and tender, around 15 minutes. To cook the cabbage on the grill, heat the grill over high heat for 10 minutes, then clean and oil the grates. Lower heat to medium-high, brush the cabbage wedges with around 2 Tbs. oil and grill directly over heat, turning after 5 minutes, until charred and tender. Arrange the cabbage wedges on a serving dish and drizzle with the vinagrette. Top with chopped cilantro.